Last week my mom came to visit for a few days, and I took her up on some free-babysitting to tackle a house project that has been hanging over my head for ages: cleaning out my pantry and prop closet! One of the big selling points of our house when we still in the house-hunting phase, was a super long walk-in closet that sits off the kitchen in our entryway. The pantry houses most of my small appliances, cookware, tons of dishes and glassware, and all of my photoshoot props. It also does double-duty as a “landing zone” where we hang our coats and keys, it’s home to our household junk-drawer, and there is even a big cedar closet in the very back that holds winter coats and beach towels. Oh and we have our microwave in there too, to save precious counter space in the actual kitchen. I give you all of this context so that you can understand how much stuff lives in this small space. 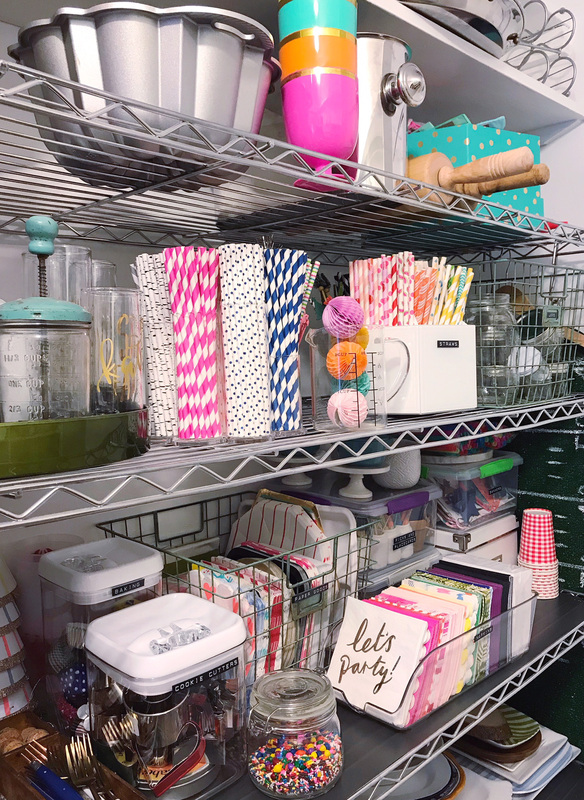 After a few years of living here, and starting to work on the blog full-time at home, the pantry was desperate for some reorganization to make it more functional. 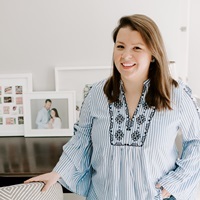 I tackled the space by dividing it into three zones: 1) My “everyday” cookware, appliances, and tableware, 2) Pantry items (dry goods, baking ingredients), and 3) My “props” that are mostly used for photoshoots. Mentally organizing everything into these categories helped me better divide up the space, and keep items with similar uses together. Once I did that, I pulled everything out of the closet, got sorting, donating, and reassessing where things should go! There is a small built-in on one side of the room that housed all of the pantry food items, and on the opposite wall I have two big wire shelves. Adding shelf-liners to the wire shelves was a game-changer and allowed more stability for stacking up boxes and plates and appliances. 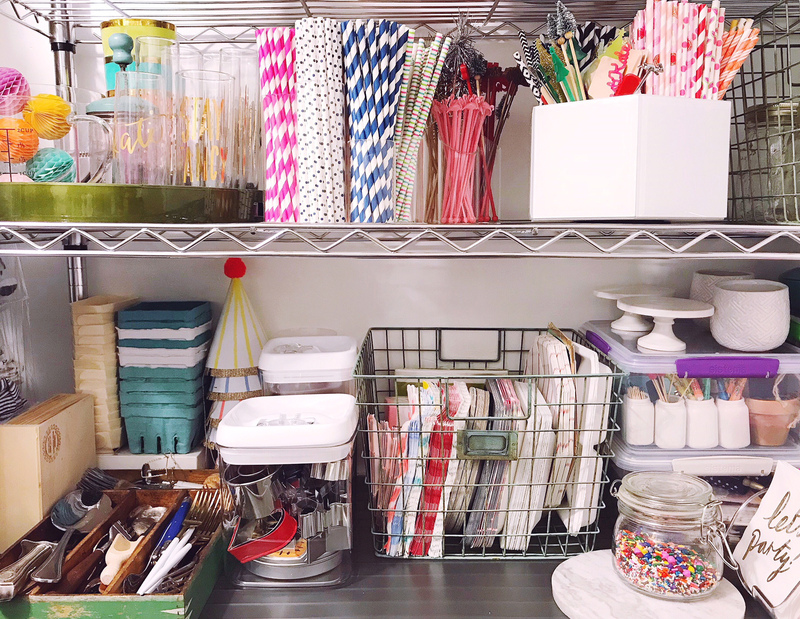 The area that needed the most work was my prop storage — and is also the space I get asked a lot of questions about on social media — so I thought I’d share in detail how I store all of this stuff! To start, I have a napkin collection that is borderline hoarder-levels. I fold all of my cloth napkins and slide them into a hanging shoe bag that sits between the wire shelves. 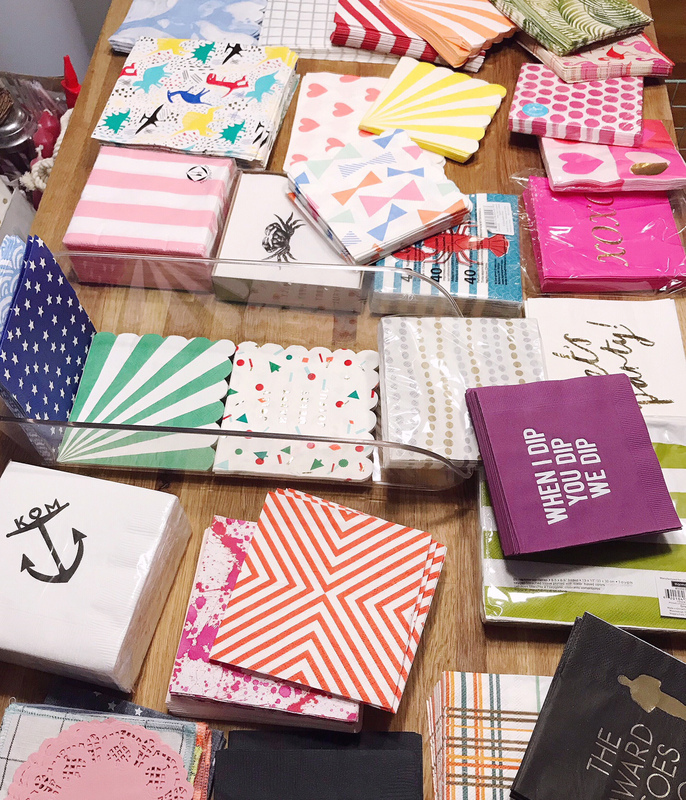 The paper napkins got sorted by color and stand upright in a can organizer meant for storing cans in the fridge (they’re the same width!). After napkins, my next biggest prop collection is straws and cocktail stirrers. 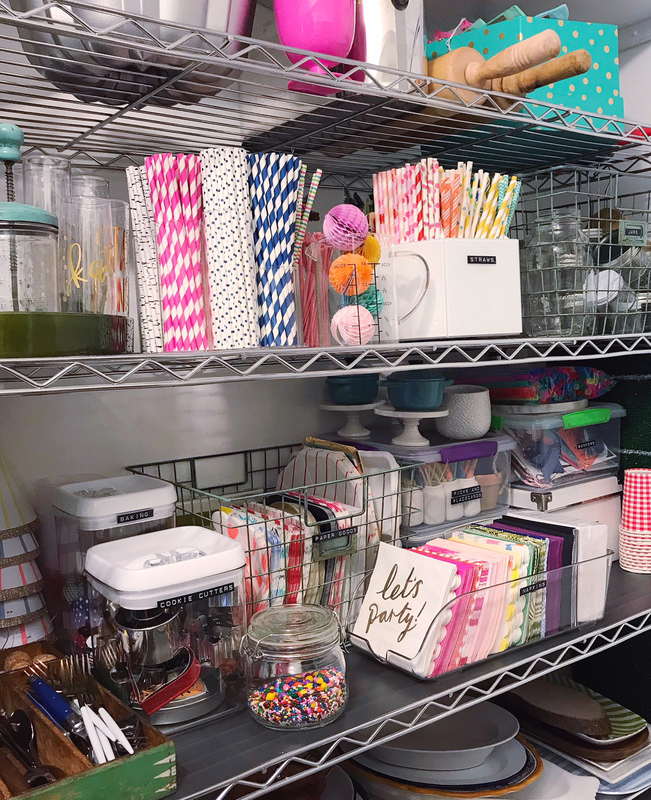 I used a combination of acrylic make-up brush holders and carousel desk organizers to sort and store these drink accessories. 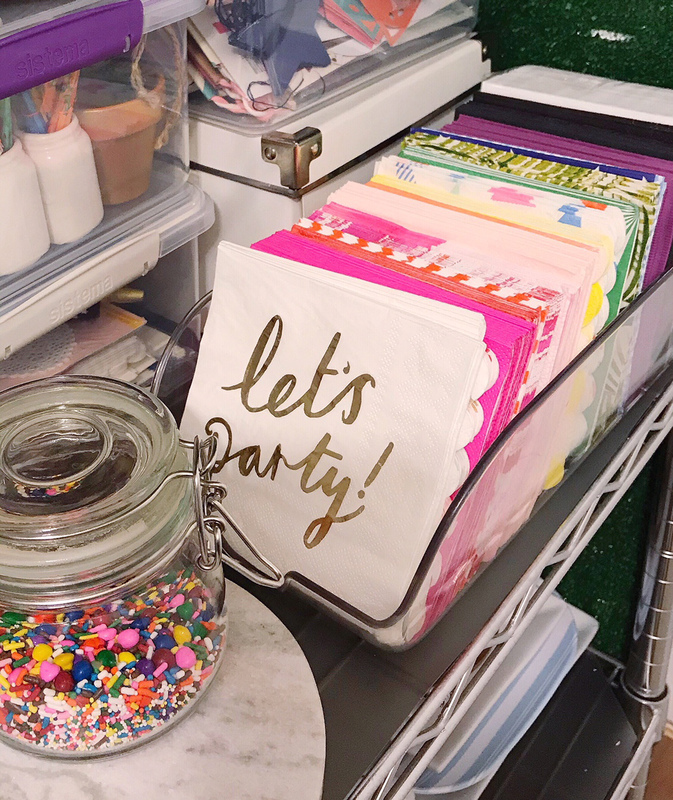 Big wire baskets hold more paper goods and stacking plastic containers with snap-on lids are used to sort out all of my place cards, party bags, cake toppers, banners and other party supplies. Tall plastic food containers hold things like cookie cutters and baking supplies, and I have a few glass jars that hold sprinkles and cake decorating supplies. I like that all of these storage containers are clear so that I can see what’s inside when I’m hunting for props or tools. I labeled all of them with my embossing label maker, of course! Below all of the party supplies I repurposed some large trays to keep loose glassware contained, and I stacked all of my various prop-plates by size and type. The bottom shelves have large rattan baskets to hold baking sheets, all of our glass tupperware, and Jane’s kid dishes. It was a huge project, but I get a little burst of joy when I walk in there now and everything is in its place. Being able to see exactly I have in my collections is actually making this a new spot for inspiration too! Zucchini Waffles. Peach and Prosciutto Toasts. One Response to "Pantry and Prop Closet Organization."